Zenith launches its new range of Ready to Print Rollers "Euro-Ultimex"
ZENITH R&D team has developed a new genre of rubber compound for printing rollers, the "EURO-ULTIMEX"
Made from unique combination of oil-resistant rubbers and polymeric plasticizers. All Ultimex covered rolls have got TIR less than 5microns which assures you of higher Print quality (less dot gain) and longer plate and bearing life. Resistant to oil, abrasion and requires less frequent setting. Low heat build -up at high speed offset machines. Extremely good nap for proper emulsion of ink and water. Grinding tolerance of less than 5 microns. Low heat build-up at high speed offset machines. Extremely good nap for proper emulsion of ink and water. Grinding tolerance of less than 5 microns. Excellent resilience. 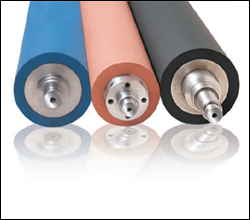 Durable and very high chemical and solvent resistance. Special elastomer to stay softer for a very long period. Resists shrinking, swelling and abrasion. It resists hardening even when continually exposed to isopropyl alcohol and substitutes. Achieves fine film thickness on its surface and on plate , resulting optimum fountain solution on plate i.e. ultimately on paper to reduce paper stretching. Facilitates more rapid attainment of the ink water balance. Excellent resilience, with grinding tolerance less than 5microns. High swelling resistance with UV inks and chemicals. Specially designed compound will help you clean easily. Hold its diamentional properties for longer period. 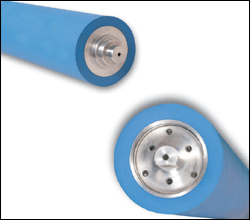 Advanced molecular locking technology to hold the shape and diamention of the rollers with continues application of uv, Hibrid and conventional inks. The surface texture of the roller will remain in affected for a longer period and, the cleaning will be very easy. 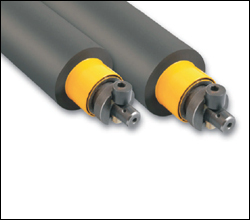 For printing less that 20% of print jobs with UV inks, then there is a chance that one can use conventional rollers. Eliminates the problem of ghosting in a lithographic printing press. 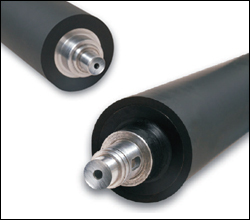 Provides smooth, relatively uniform coating of ink to the ink-receptive area of the plate cylinder in a lithographic printing press. Improves the quality of the image printed by a lithographic printing press. 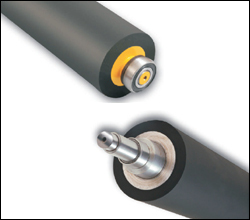 Suitable for high speed sheetfeed off set printing.